White, filamentous bacteria thrive in the warm fluids seeping from pockets in the 3-month-old lava flow. White “snowblowers” drift through the water. 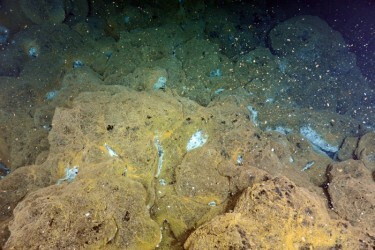 Orange bacterial mats cover vast areas of the still cooling lava flow. This spring, seafloor seismometers connected to shore by a new Internet cable showed that the 3,600-foot-tall underwater Axial Volcano started shaking April 24, 2015 and shook continuously for several days. 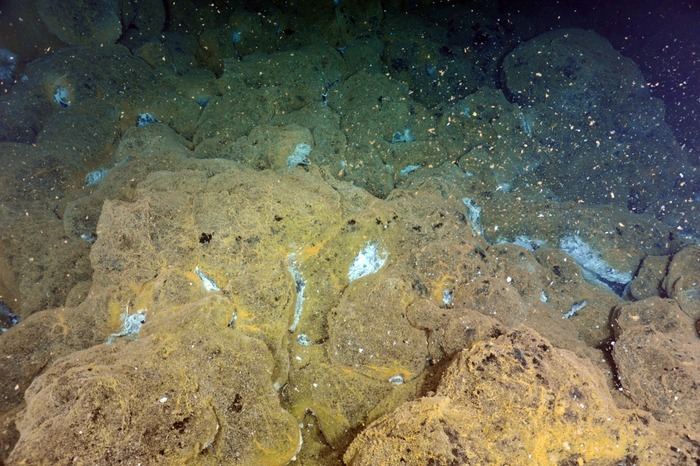 University of Washington oceanographers visited the deep-ocean volcano in late July and parts of the seafloor were still warm, giving the team a glimpse into the changes that happened around the the mile-deep volcano 300 miles off the Oregon coast. The recent visit, part of a larger cruise, was scientists’ first chance to see the site and explore what happened.